Starbucks Corporation (Nasdaq: SBUX) started its earnings announcement with good news. The company reported earnings per share (EPS) of $0.65, significantly better than analysts’ consensus forecast of $0.57. Sales numbers were also good, at first glance. Globally, comparable sales increased by 2% in the first-quarter, driven by a 2% average ticket increase, according to the company. The strongest growth was reported in China, an important market for the coffee maker. Chinese sales grew by 6%. Membership in the company’s rewards program also grew in the three month period. Memberships were up 11% compared to the same time a year ago. However, the sales numbers weren’t good enough. Wall Street analysts’ forecast for total sales in its first-quarter earnings report was for sales of $6.2 billion, just above the revenue of $6.1 billion the company reported. Traders reacted to the news by selling the stock, accelerating a down trend and breaking support on the chart. “Holiday (limited-time offers) and merchandise did not resonate with our customers as planned,” Chief Executive Kevin Johnson said on a conference call with analysts. Starbucks offers holiday-themed drinks such as the Chestnut Praline Latte and Gingerbread Latte as well as gift cards, mugs, coffee and tea gift boxes and teddy bears to woo holiday shoppers. Johnson also blamed the quarter’s disappointing same-store sales results on an ongoing shift towards online shopping from brick-and-mortar stores, as well as waning customer interest in the afternoon and evening hours. Starbucks said it now expects 2018 global same-store sales growth at the low end of its previously-issued view of 3% to 5%. While the news about growth in China was good, traders were left with questions about the company’s operations in the United States which remains Starbucks’ largest market with about 14,000 stores. Analysts are questioning whether Starbucks can deliver growth at lunchtime and later in the day, which the company hopes to do with offerings including a different drink mix, including some different coffees (and more access to its beer-like drink, Nitro Cold Brew and a more widely available Mercato food menu. New and updated products, an analyst with Tigress Financial partners wrote in an earlier report, can drive higher-margin sales and attract more customers later in the day. That could mean specialty coffees, nondairy options, more juices, food and perhaps even more widely available alcohol. “The ability to round-out traffic throughout the day…can be a significant growth and profit opportunity,” the analyst wrote. Analysts would also like to see more users for the company’s mobile order and pay systems, which are expected to be available to all customers, rather than only loyalty program members, soon. Barron’s also noted, “But there’s some frustration out there, too. “We are uncertain whether the cause of slower U.S. sales has been identified or the company’s plan will improve results,” Stifel analysts wrote within hours of the earnings release. For SBUX, we have a number of options available. Short term investment tips options allow us to trade frequently and potentially expand our account size quickly. Short term trades also reduce risk to some degree since there is less time for a news event to surprise traders. In this case, we could sell a February 9 $58 call for about $0.35 and buy a February 9 $59 call for about $0.15. This trade generates a credit of $0.20, which is the difference in the amount of premium for the call that is sold and the call. Since each contract covers 100 shares, opening this position results in immediate income of $20. The credit received when the trade is opened, $20 in this case, is also the maximum potential profit on the trade. The maximum risk on the trade is about $80. The risk is found by subtracting the difference in the strike prices ($100 or $1 times 100 since each contract covers 100 shares) and then subtracting the premium received ($20). This trade offers a potential return of about 25% of the amount risked for a holding period that is about two months. This is a significant return on the amount of money at risk. This trade delivers the maximum gain if SBUX is below $58 when the options expire, a likely event given the stock’s trend. 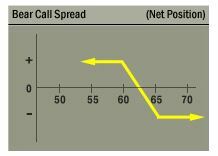 Call spreads can be used to generate high returns on small amounts of capital several times a year, offering larger percentage gains for small investors willing to accept the risks of this strategy. Those risks, in dollar terms, are relatively small, about $80 for this trade in SBUX. These are the type of trading strategies that are explained and used in stock trading tips Options Insider service. To learn more about how options can be used to meet your goals, click here for details on Options Insider.